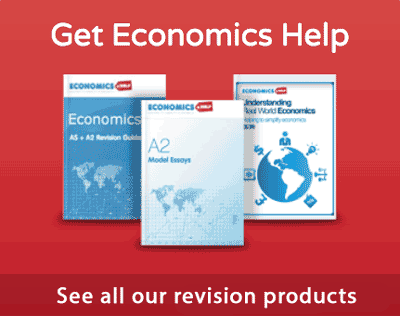 Home > Economics help blog > inflation > How does inflation affect firms? 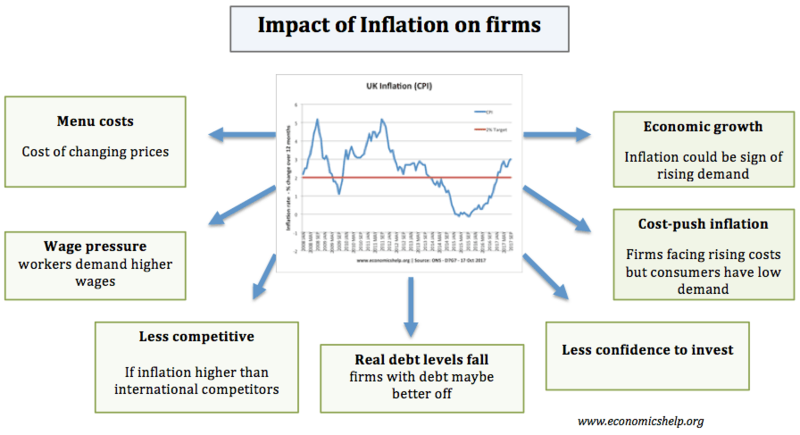 How does inflation affect firms? Firms generally prefer inflation to be low and stable. If inflation rises above 3 or 4%, firms may see a rise in costs and uncertainty. Inflation can also cause firms problems of rising costs, falling profitability, and a decline in international competitiveness. However, inflation is not necessarily damaging for a firm – especially, if they can increase prices to consumers more than their costs of production rises. Menu costs. These are the costs of changing price lists. If inflation is high, then firms will have to update prices more regularly. There are costs involved in this. For firms like Pound / Dollar shops, this high inflation could be particularly damaging because it becomes harder to find goods which can be sold for a Pound. However modern technology makes changing prices much easier than before. These days, you don’t need to change prices manually but can update barcodes and this is less time-consuming. 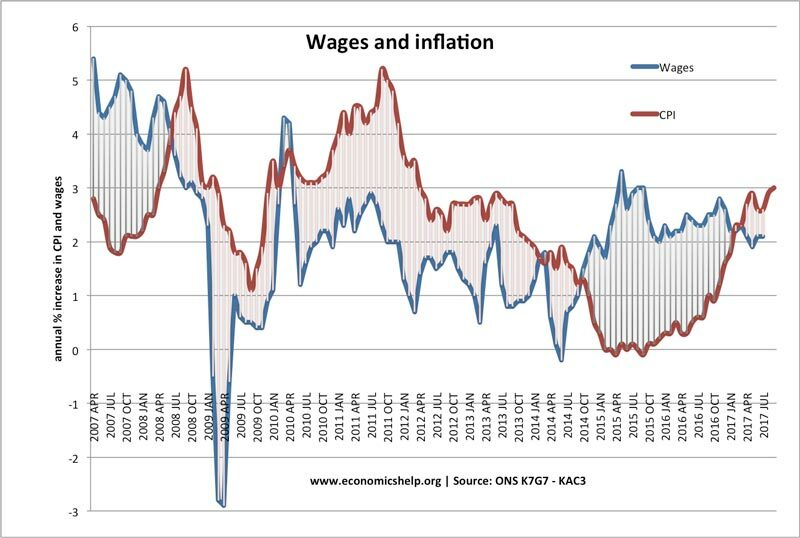 Wage Inflation. Unexpected inflation may lead to the necessity of renegotiating wage deals with workers. However, these wage rises may be expensive for the firm because they cannot afford them. Uncertainty and confusion. If inflation is higher than expected, then the costs of investing will be changing frequently. This makes firms less willing to invest because they are uncertain over future costs, wages and future demand This is particularly a problem with unexpected cost-push inflation raising the price of raw material costs. 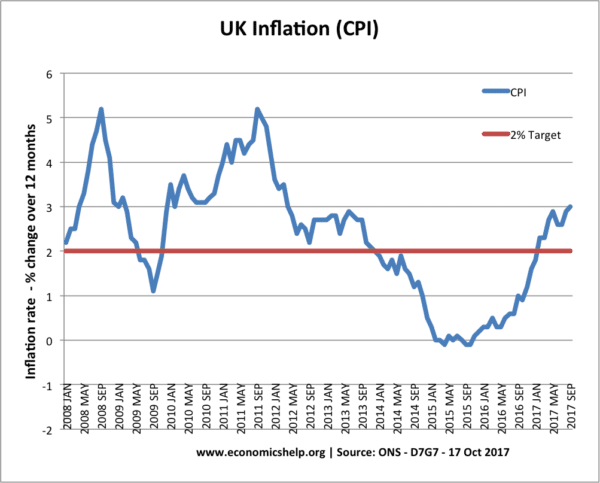 This is perhaps the biggest cost of inflation for firms – high inflation creates uncertainty and can lead to lower growth. International Competitiveness. If UK inflation is higher than other countries, then this will make UK firms less competitive than international competitors; this is important for exporters. A higher inflation rate than our competitors will also lead to a depreciation in the exchange rate; this will help to restore competitiveness but at the expense of more expensive imports and a decline in living standards. These costs of inflation will be worse if the inflation is unexpected. For example, if firms expect inflation of 2%, but, it proves to be 5%, this is worse than if they had expected inflation of 5%. One of the most problematic types of inflation for firms is cost-push inflation. This is inflation due to a rise in the cost of raw materials – but at the same time demand falls. Therefore, firms have both rising costs, but also lower demand. Therefore, firms are usually pushed into reducing profit margins and absorb the price increases. Inflation can be beneficial in some circumstances. Reduces the value of debt. If firms have debt, then inflation may help reduce the real value of debt. This is because, under inflation, nominal revenue will be rising – making it easier to pay off old loans. 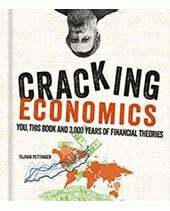 In this case, inflation is more desirable than deflation, where the real value of debt will be increasing. Though it also depends on interest rates. If high inflation leads to high-interest rates, then firms with debt will see rising interest rate costs. Strong economic growth usually results in at least a moderate inflation rate. For example, suppose inflation is very low 0.5% – this is probably associated with low economic growth. A stimulus to demand will see higher inflation and higher economic growth. In this case, rising inflation can lead to an increase in profitability for firms. Moderate inflation makes it easier to change relative prices and relative wages. For example, if you have inflation of 0%, it is hard to cut nominal wages for unproductive workers. But, if inflation is 2%, it is easier to have pay freezes and effective real wage cuts for unproductive workers. 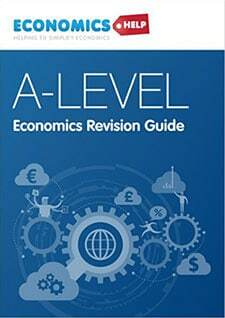 How does inflation affect the profits of a firm? In a period of demand-pull inflation, with rising economic growth, the firm will see rising demand and it is able to increase prices. In this case, it may be able to increase profits, at least in the short term. 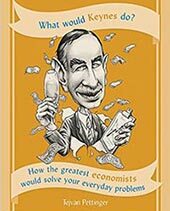 Though – if the inflationary growth leads to a boom and bust – it may be followed by a recession where demand and profits fall. In a period of cost-push inflation, it depends whether firms are able to pass their rising costs of production onto consumers. If markets are very competitive and demand weak, firms may face pressure to absorb cost rises by reducing profit margins. In the long-term, a low inflationary environment may facilitate higher investment and growing demand, which improves profits. In 2016, the UK saw a 15% depreciation in the value of the Pound due to Brexit vote. This depreciation led to a rise in import prices. Firms saw in input prices rise. However, despite higher inflation, firms were able to keep wage growth low. Real wages actually fell. Therefore, the cost of inflation was felt more by workers than firms. There is a time delay for firms to pass on the higher costs onto consumers. But, also firms may try to avoid increasing prices. In other words, Tesco (which has a degree of monopsony buying power) is trying to make food manufacturers absorb the input price rises and reduce their profit margins. It is a move that will be popular with consumers (and perhaps good advertising for Tesco), but will producers be able to keep absorbing all the input price increases themselves?